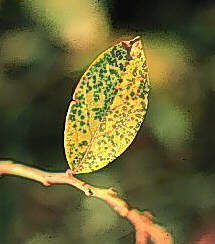 Leaf rust, caused by the rust fungus, Pucciniastrum vaccinii (synonyms: P. myrtillus, Naohidemyces vaccinii, and Thekopsora vaccinii), is most prevalent in the southeastern United States. Rabbiteye cultivars suffer from premature defoliation and highbush blueberreis are subject to occassional localized outbreaks in the eastern coastal states. The disease first appears as yellow leaf spots on the upper leaf surface of new blueberry leaves. Spots later turn reddish brown. Entire leaves may turn brown, die and drop prematurely if infections are severe. Yellowish orange pustules become visible on the lower leaf surface about mid-summer. This disease also occurs sporadically on highbush blueberries after harvest. Airborne spores (aeciospores) infect newly expanded blueberry leaves in the spring. Leaf spots usually become visible in mid-season. Spores (urediniospores) released from rust pustules (uredinia) formed in mid-season on blueberry lower leaf surface below these leaf spots my re-infect blueberry leaves, leading to disease build-up on blueberry. Telia form in the blueberry leaf infections late in the season. They appear as flat, dark-colored crusts on the lower leaf surface. Leaves infected with telia drop to the ground where the fungus overwinters. The fungus's alternate host Hemlock needs to be present for the disease cycle to be completed. Leaf rust is most prevalent in areas within the natural range of hemlocks. Remove all hemlocks within 0.25 miles of the planting. Apply two to three fungicide sprays from August to mid-September. For current fungicide recommendations, consult your local extension agent or see the Southeast Regional Blueberry Integrated Management Guide. Bristow, P.R., and Stretch, A.W. 1995. Leaf rust. Pages 20-22 in: Compendium of Blueberry and Cranberry Diseases. F.L. Caruso and D.C. Ramsdell, eds. APS Press, St. Paul, MN. 87 pp. Farr, D.F., and Rossman, A.Y. Fungal Databases. Systemic Mycology and Microbiology Laboratory, ARS, USDA. Retrieved 01 June 2010.